A man named Dax has invested all he has to enter a team in a blacktop basketball tournament known as the Rucker Classic, only to have his ringer and his entire squad stolen by an old rival. Now, up against a wall, he rounds up a group of aged former greats to face off against the young guns in the tournament for a chance at redemption and a big cash prize. Can Hollywood turn an advertising mascot into a feature-length film? It worked for Ernest P. Worrell, so why can't it work for Uncle Drew? The movie "Uncle Drew" is directed by Charles Stone III, who has directed movies such as "Drumline," "Mr. 3000," and "Paid in Full." It is written Jay Longino, whose other writing credits include "Skiptrace" and the straight-to-video "Bachelor Party 2: The Last Temptation." 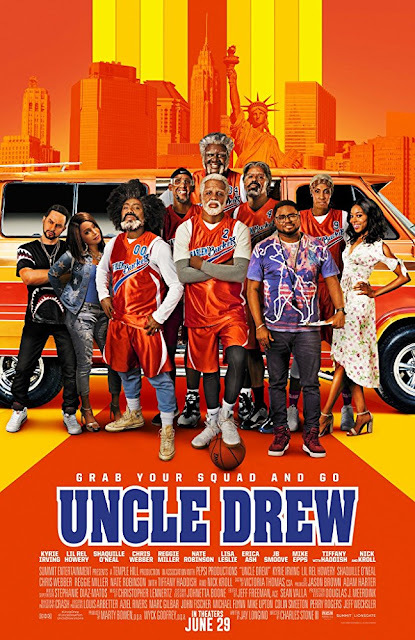 It is based on the Pepsi Max mascot and now titular character Uncle Drew (Kyrie Irving). The story revolves around a young Footlocker employee named Dax (Lil Rel Howery), who has recently taken out his life savings to use as an entrance fee into the blacktop basketball tournament known as the Rucker Classic. Winning this competition means winning a $100,000 prize, and he thinks he has just the team to do it thanks in large part to his star player Casper (Aaron Gordon). When Dax's old rival Mookie (Nick Kroll) steals his team including Casper away from him, he has to think fast and come up with a new team or be out the entrance fee and prize money. Dax hears about a legendary athlete named Uncle Drew, the greatest blacktop player of all time, and seeks him out to recruit him for his crew. When Dax eventually finds him, he asks him to join his team despite being a septuagenarian. Uncle Drew agrees to participate on one condition: he gets to pick the teammates and run the show. 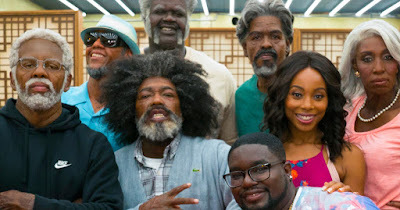 Now, Uncle Drew, Preacher (Chris Webber), Lights (Reggie Miller), Boots (Nate Robinson), and Big Fella (Shaquille O'Neal), his group of longtime friends/senior citizens are set to face off against the toughest players in blacktop basketball. We had many reservations going into this film. After all, it is based on a commercial, which means it is in constant danger of becoming a one-joke premise stretched out for 103 minutes. 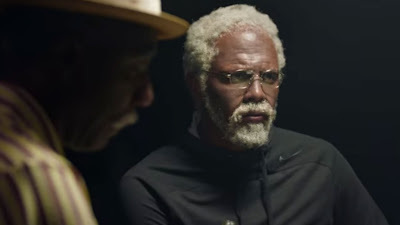 If the whole movie was just about Kyrie Irving and a bunch of other pro-basketball players in mediocre old-age makeup out-doing a bunch of young ballers, the concept would get old pretty quick, no pun intended. 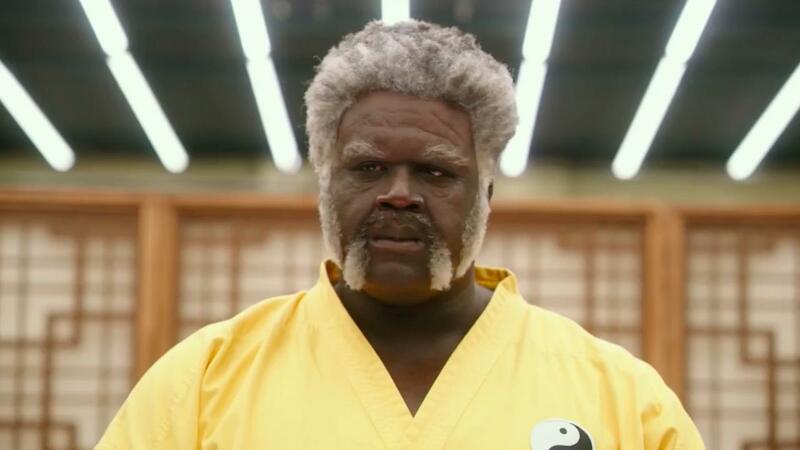 Luckily, "Uncle Drew" is anchored by a lot of funny actors to surround the geriatric b-ballers and their shenanigans. Lil Rel Howery is very charming and extremely humorous. He is a likable and sympathetic guy, which makes Dax a character you really want to root for. Dax gets to have a bit of back and forth with his rival Mookie and his one-time girlfriend Jess, who have the advantage of being played by supremely talented comedians Nick Kroll and Tiffany Haddish, who elevate the project even further. All three of these characters get the chance to bring some big laughs, which quite frankly we were surprised about, once again, given the fact that the character comes from a soda ad. The movie also has some good heart and tries to have a genuine message. As for the former NBA All-Stars, most of their content is limited to heartfelt drama and physical gags stemming from the fact they are playing 70+-year-old men who can still dunk, pick and roll, and hit three-pointers with the best of them. Most of their jokes are basically "haha, old people can act like young people," and "oh wow, look how cocky new basketball players are now." The only exception to this is Shaq, who gets a couple of non-age related gags given his character's status as a Zen master. Sure, "Uncle Drew" is a formulaic mashup of a road trip flick and a traditional sports underdog story, but it is still mostly entertaining and is much funnier than we anticipated. Hey, if two people who don't even like basketball can find some enjoyment in this film, it can't be half bad, right? The road trip aspect did drag for us at times, but beyond that, this is an otherwise decent watch that may have you laughing as well.